I know a feature on rosé wines in Valentine’s month is a bit of a cliché, but then there’s nothing wrong with the occasional soppy cliché – and pink Champagne is an interesting category in its own right. Having been on an upward curve for several years now, rosé wine in general is still enjoying a remarkable surge in popularity. The Champagne houses have not been slow to cash-in, with a string of established houses suddenly releasing rosés for the first time, and others placing much more emphasis on a style of Champagne that was once slightly peripheral. Of course there are plenty of sparkling wines other than Champagne that give pleasure. I quite enjoyed the frivolity of the off-dry, Kir Royale-like pink fizz from Veuve du Vernay that’s currently on offer in Tesco at just £4.99 (down from £6.99 until February 24th), but for certain occasions, only Champagne will do. This selection covers a variety of styles from off-dry and fruity to bone-dry and mineral, and a variety of price points from under £20 or over £100. If you are planning on opening a bottle for Valentine’s night then hopefully there will be something to tickle your fancy. Suggested retail prices and main stockist given, but there will undoubtedly be plenty of deals around on Champagne over the coming week or so, so do shop around and try the wine-searcher link included on some of the more widely-available wines. This is a new listing at The Co-operative, produced by a cooperative, in this case the CRVC in Reims. It pours quite a deep pink/pomegranate colour and has plenty of very small bubbles. It is immediately fruity, suggesting raspberries and kirsch, and a bit of creamy depth. On the palate this has an attractive edge of sweetness initially, folded into a smooth creamy mousse and creating and easy-drinking, attractive mouthful of wine. The acidity comes through, but there’s a definite richness to this wine that is deliciously easy to drink. 88/100. The Co-operative, reduced from £26.99 to £16.99 until 15th February 2009. This Chardonnay and Pinot Noir rosé has a fairly delicate salmon pink colour through which runs a steady stream of smallish bubbles. The nose has a touch of yeasty, sherbetty quality backed up by red fruits. On the palate this is a modestly endowed Champagne, with a good core of lemony acidity but the fruitiness of the palate being fairly quickly subsumed. Tasty when drunk with some pork medallions in a light creamy mustard sauce, where it’s robust nature worked well. 86/100. £33.99, Thresher and Wine Rack, but £19.98 until Feb 14th. 1957 was the first year of production for Mumm’s pink, an assemblage of 77 vineyards much of them Grand and Premier Cru. With 12% – 14% of Pinot Noir red added, this has a juicy, strawberry-fruited nose that is creamy, luscious and inviting with a hint of vanilla custard. The mousse is fresh and persistent, and those soft red berry flavours of strawberry and raspberry really push through with very good fruit sweetness and just a touch residual sugar. But this clean and elegant, with a bit of savoury grip on the finish making it food friendly too. 89/100. £33.99, Oddbins, Sainsbury’s. See all stockists on wine-searcher.com. Around 15% Bouzy Rouge is added to this cuvée, which cellarmaster Hervé Deschamps selects for colour and flavour, presumably giving its distinctively cherryish hue, with a hint of copper. This is a very red-fruity Champagne, with quite vivid raspberry and floral. kirsch-like notes. On the palate the crisp effervescence fairly dances on the tongue, with plenty of lemony acidity slicing through the richer red fruit flavours. There’s a hint of tannin and spice in the finish of this wine that suggests it would also be friendly to quite substantial food. 89/100. £39.49, Majestic, Selfridges, Harrods, Harvey Nichols, Vintage House. See all stockists on wine-searcher.com. Eighty per cent of Taittinger’s blend is vinified as a white Champagne, before 20% of red wine is added, giving a bright, zingy, salmon pink colour. The tiny bubbles explode in a torrent across the glass, and the nose has some yeastiness and an attractively soft strawberry fruit, but there’s something a little bit truffly and rich too. On the palate this is a very elegant wine, in quite a firm style, with good structure and a lovely acidity. Intelligent, classic stuff. 90/100. From £39.99, Tesco, Sainsbury’s, Waitrose, Thresher, Oddbins, Majestic, Harrods, Fortnum & Mason. See all stockists on wine-searcher.com. Bollinger spent a decade working on its relatively new non-vintage rose, joining its small portfolio of Champagnes that already includes a vintage version. This is another Champagne made by blending still red wine, in this case from Bollinger’s own Grand Cru vineyards in the Côte d’Aÿ and Verzenay. There’s a delicacy about this wine, with little summer strawberry notes and a suggestion of mealy, biscuity depth in the background. On the palate this is fresh and elegant, but the fruit is ripe and quite full, and the barrel-aged component gives structure with a touch of tannic grip and crisp acidity. A very nicely pitched rosé for drinking or cellaring. 90/100. Around £55.00, Waitrose Fine Wine, majestic, Berry Bros & Rudd, Fortnum & Mason, Selfridges. See all stockists on wine-searcher.com. Roederer use the saignée method for this wine, macerating the 70/30 blend of Pinot Noir and Chardonnay grapes until some colour is extracted. It is then held in Roederer’s cellars for at least four and a half years before release. This has a very pale, delicate partridge-eye colour with a nose that is subtle and refined. There’s something quite mineral, with little toffee notes and plenty of raspberry fruit coming through. Delightfully racy on the palate too, and really quite elegant with a cool, savoury character and a touch of tannin and spice. 91/100. Around £60.00, Fortnum & Mason, Harrods, Harvey Nichols, Vintage House, Casevalue.com. See all stockists on wine-searcher.com. What an absolute treat to taste this deluxe cuvée for the first time, and in such a great vintage. Belle-Époque’s iconic, hand-painted bottle looks even finer adorning the rosé version, which is composed of all three main Champagne grapes, with the addition of 8% red wines from Ambonnay and Aÿ. There’s a strong familial resemblance to the regular Belle Époque, with its freshness and slightly lean beginning, with subtle, delicate zesty aromas joined by cherry and soft redcurrant fruit. On the palate this has great finesse and a sense of precision, but there is structure here and a subtle layering of flavour and texture. It would be a sinful act to drink this now, but what an exceptional Valentine’s gift to cellar for 10 years or more, perhaps for a future anniversary? 92/100. £80 – £120, Harrods, Selfridges, Fortnum & Mason, Harrods, Harvey Nichols, Vintage House. See all stockists on wine-searcher.com. 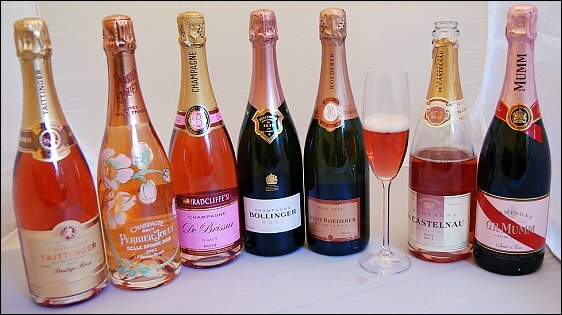 See all stockists of Rosé Champagne in the UK on wine-searcher.com.